The patented Bearing Monitoring System BeMoS® engineered by BestSens allows to monitor all relevant variables of bearing and lubricant with a single system. It provides a complete picture of the current operational state of a bearing. More specifically, the machine operator can access the comprehensive information about changes of the state of lubrication, axle load, temperature and cage speed at any time. Unlike conventional methods, e.g. structure-borne noise measurement, BeMoS® is based on acoustic excitation, that is, it generates surface acoustic waves on the outer race of the bearing to probe its interior. The propagation of the surface wave is influenced by the motion of the rolling elements. 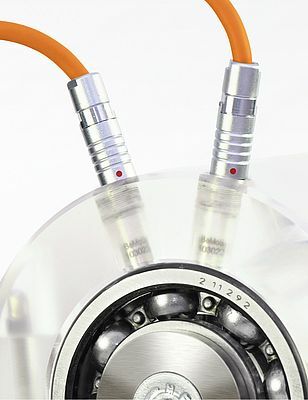 Using BeMoS® can help: lubricate the bearing only when really necessary; use raw materials in a sustainable way; cut maintenance costs; extend the service life of the bearings; extend the service life of your machines; control production processes according to optimal load conditions.